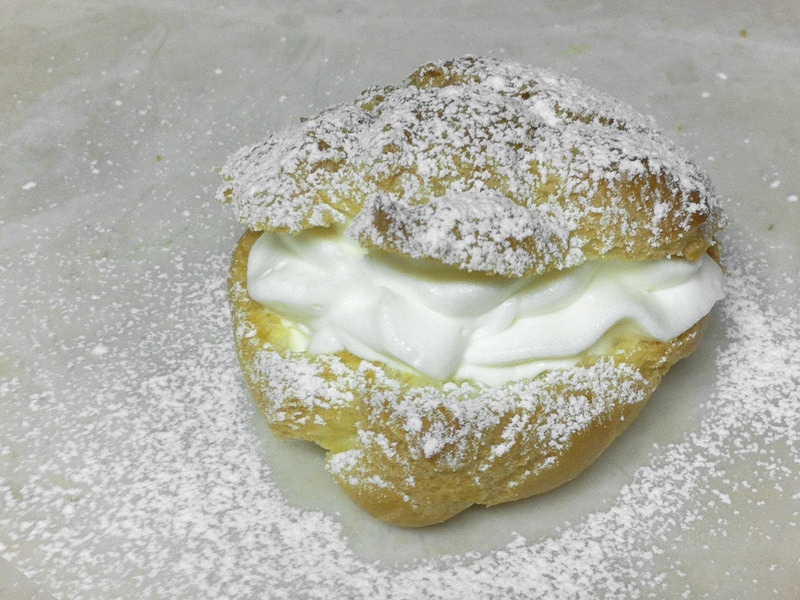 cream puffs are surprisingly simple. all in all, it’s just heating up some ingredients, mashing them, beating them and plopping them onto a cookie sheet, in any shape or form. it’s the ingredients that do all the magical work…not you…so there’s really no pressure! have i talked you into it yet?! i adapted my recipe from my favorite pie and pastry bible by rose levy beranbaum. preheat your oven to 400º and line your pans with parchment paper. in a medium sized saucepan, stir together water, salt, sugar and butter. stir over medium heat till mixture just comes to a rolling boil. remove from heat and pour in flour. mix together till ingredients come together to make a ball. return the saucepan, back to low heat, for another 3 minutes to cook the flour…stirring and mashing as if you’re mixing up mashed potatoes. transfer this mixture to a large bowl. add in eggs one at a time. with an electric mixer beat the mixture for about one minute after each egg is added. your mixture should be smooth and shiny. you can pipe your mixture onto a cookie sheet, but i opted just to use two spoons to drop the mixture/batter/dough (what do you call this stuff?!) onto the pan to avoid all that extra clean up. i thought my results came out just like the picture i saw, so i had no regrets. take two spoons and use one to scoop up the batter and the other to scrape it off the other spoon onto your cookie sheet. leave about an inch and a half between each dollop. bake for 30 minutes, till pastry has puffed up and turned a nice golden brown. transfer pastries to a cooling rack and with a sharp knife cut a small slit in the side of each pastry to release steam. leave these to cool to room temperature, in a draft free area. while they are cooling, go ahead and whip up your filling. there are lots of options here…ice cream, custard, pudding….but B is a whipped cream fan, so that’s what i’ve got for you. begin by putting your mixing bowl and beaters in the freezer for about 15 minutes. using your chilled mixer bowl and beaters or whisk attachment, beat the remaining 3 /4 cup heavy whipping cream at a high speed till you begin to see distinct lines forming in the cream. with the beaters still going at high speed, pour in your cooled, sugar/cream/vanilla mixture. the next part happens pretty quickly, so pay attention. continue beating this mixture till it forms stiff peaks, being careful not to over-beat. happy birthday B….i’m so glad you get to scope out the new age before me, to let me know what to expect. welcome to your mid-late twenties….i know you don’t like the sounds of it….but i bet you like the sound of late-late twenties less….so rock this year out and enjoy it to it’s fullest! love you girly! Thanks so much for sharing and eradicating the intricasies of such a delectable delight. Do you have any secret weapons in your arsenal for a pastry cream for a secondary choice of filling ? hmmm, secret weapons….the frosting used on the white on white cupcakes, from last week, makes a really good filling. ice cream would also be an easy choice! but for this whipped cream, the cornstarch makes a huge difference! glad you enjoyed the recipe!